A display of classic red and white carnations in a traditionally styled funeral basket is a tasteful expression of sympathy. This delicate wicker basket filled with beautiful vibrant flowers is the perfect sentiment for the service or the home. This gorgeous dish garden will bring comfort and extend sympathy throughout the months ahead. 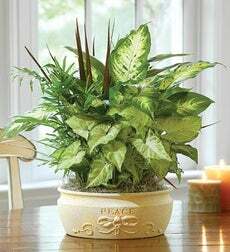 With white blossoms extending from lush dark green leaves, the Peace Lily plant is an ideal expression of sympathy. Plant the butterfly bookmark and striking forget-me-not flowers will grow in memory of your loved one. Red carnations, white carnations, and white Monte Casino are surrounded by greens in this traditional arrangement.